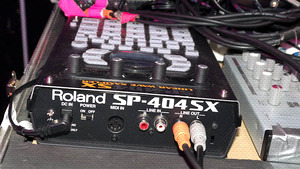 KitMonsters – Roland SP-404 SX. The music makers’ guide to making music. Linear wave sampler with built-in mic, effects and trigger pads. Effects include a looper and voice transformer. Also has a pattern sequencer, can be battery powered and you can import audio files from your computer and assign them.